Hello my favourite friends! What have you been up to? Last night I went with some friends to see Silver Linings Playbook. I didn't know much about it but I thought it would be a regular romantic comedy. It turned out to be both a good laugh and not so run-of-the-mill :) It was worth my seven dollars, I think! (Half-price Tuesdays!) Have you seen any good films lately? The base I used is OPI Don't Pretzel My Buttons. With a white striping polish I painted the feathers, outlining them with a striping brush and American Apparel Gold Flash. For the tribal nails I painted half of my nail with American Apparel Gold Flash. Then I took the white striping polish to make vertical lines, filling in parts with American Apparel The Valley and Essie Play Date. I used a dotting tool for the circular details. Your mani looks lovely! I really like the colors you used! 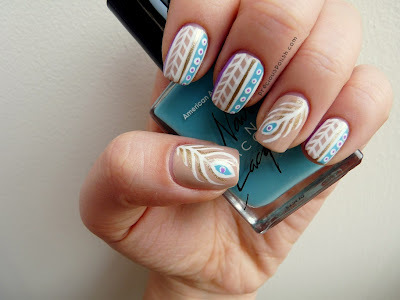 love this combo - i want to try that tribal design now!